I couldn’t gift an item that was sub par so I removed one button/snap band, lined up the ridges and snaps and sewed it back on. I feel better even though I’m sure the Birthday Girl didn’t care. I did. The color is hard to capture on camera but the above picture is pretty close to the actual color. 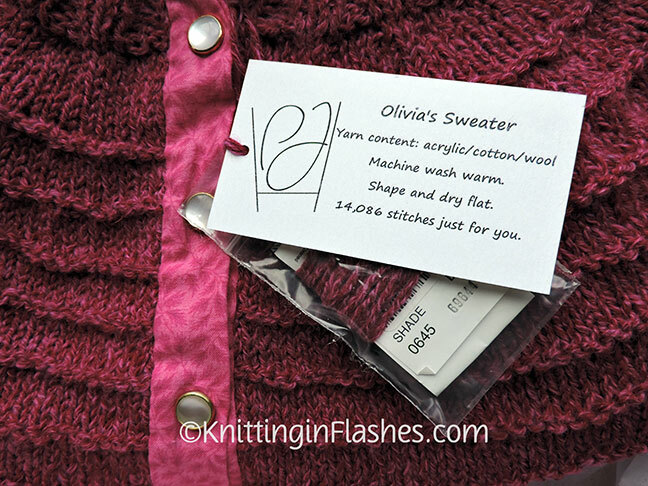 I try to include a care tag and a bit of extra yarn with all my gifted items. It also shows how many stitches are in the item. The gifts weren’t opened before we left so no pictures of the model and sweater. 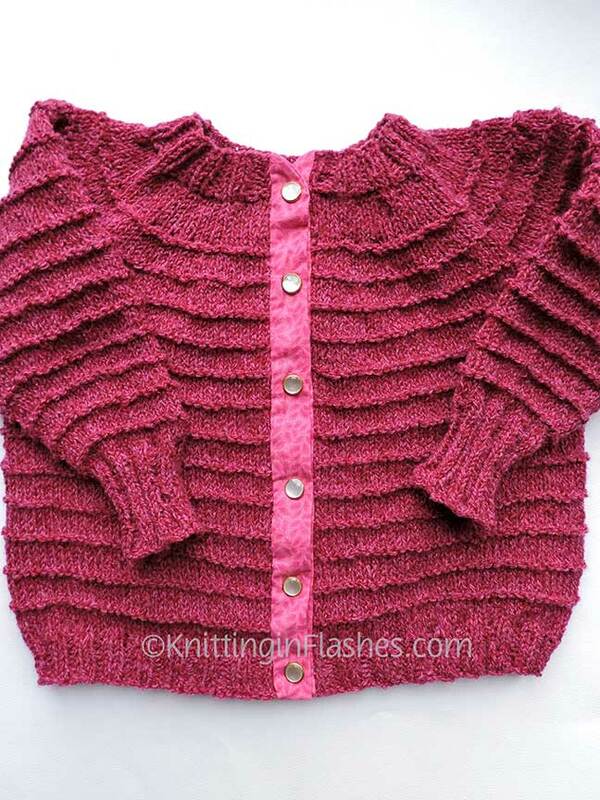 This entry was posted in baby sweater, knit, knitting, sweater, yarn and tagged finished object, knit, knitting, sweater, yarn by Patti_is_knittinginflashes. Bookmark the permalink. Well I know you feel so much better. And it looks great. The receiver should LOVE it! Much better. That would have bothered me, too, if I were gifting it. The first baby sweater I knit as a gift had a mistake. 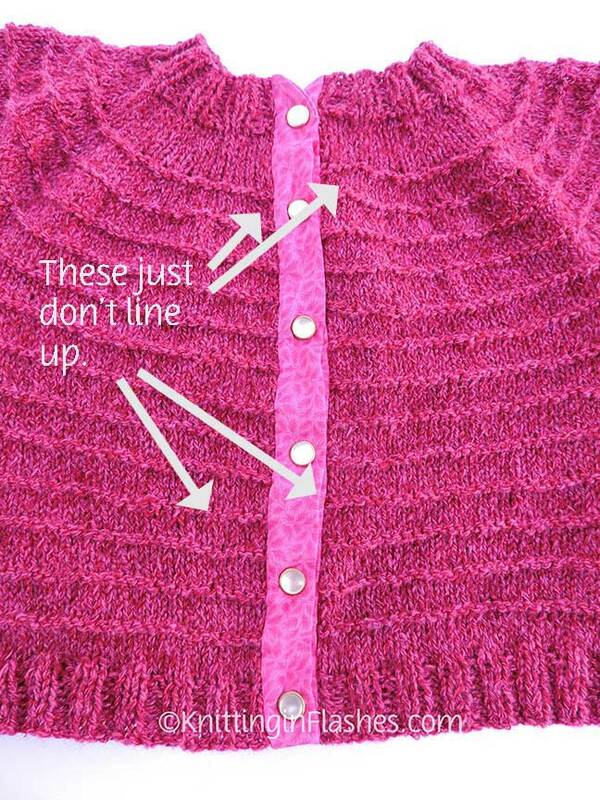 I dropped a stitch close to the neck and didn’t discover it until I was sewing on the buttons. I almost ripped it apart to fix it but Mel (at Millicent’s Yarn Shop) told me to just catch the dropped stitch with thread and secure it. I was horrified that a fellow knitter would suggest such a thing but did exactly as she said. I’m the only one who knew it (other than Mel) but it still bothered me. Perfectionism is a terrible thing.